This is really why I love Thanksgiving. This is what I looked forward to all year long as a kid. My family only made stuffing on Thanksgiving, so I had one chance the entire year to have some! We made Pepperidge Farms stuffing and I thought it was the best food on the planet. Until I realized I was sensitive to wheat. 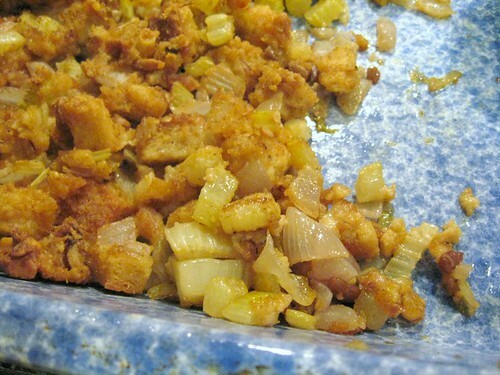 It wasn't until I became gluten free in 2007 that I learned how to make real stuffing from scratch. Michael loves stuffing too. And since we could both stand to lose a few pounds, it's a good thing we continue to only make this wonderful dish around the holidays! I made a test run of a gluten free vegetarian dressing/stuffing recipe earlier this week. We had it with dinner and absolutely loved it! Especially with a savory mushroom gravy, which I'll be posting later this week! To make GOOD gluten free stuffing, you need a bread that tends to be a bit dry -- but doesn't become MUSHY when wet. Food for Life Brown Rice Bread is what I often keep in the freezer. It's vegan (no eggs), gluten free, and made from whole grains. It's also available locally and the texture is perfect for stuffing. I used vegetable broth as my liquid, although you could equally use water, chicken broth, or turkey stock. I decided to add nuts to this vegetarian stuffing both for crunch, flavor, and protein. 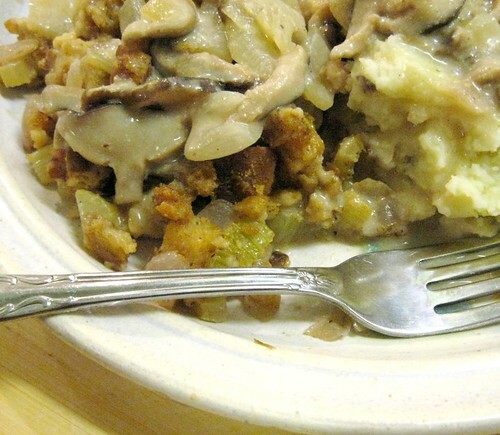 I believe you will truly enjoy this vegetarian stuffing. We certainly did and I will make a large batch to take to our family Thanksgiving dinner next week. Place cubed gluten free bread in a LARGE bowl and set aside. Melt 1-2 teaspoons of coconut oil or vegan margarine in a large skillet on the stove top. When sizzling, add chopped onions, celery, walnuts, and sunflower seeds. Saute until onions are translucent. Add salt, pepper, and poultry seasoning. Cook until onions and celery are translucent and softened. Add cooked vegetables and nuts to bread cubes in large bowl. Mix thoroughly. Slowly add 1 cup of vegetable broth or desired liquid to bread cubes. If you like a moist dressing add additional chicken broth until desired consistency is reached. Pour dressing into an oven safe casserole dish or large 9 x 13" baking pan. Drizzle remaining melted coconut oil or vegan margarine evenly over the dressing. Bake in preheated 350 degree oven for 20-30 minutes until crispy and brown on top. Serve immediately! Vegetable Broth: Feel free to use whatever liquid you prefer. Traditionally of course, chicken broth or turkey broth is often used. But water also works just as well, though it does lack in flavor. Use what you have available though, I don't think it will change the overall taste of this dish! Walnuts & Sunflower Seeds: I added these for crunch, texture, and of course flavor. Feel free to use the nuts and/or seeds that you prefer and have on hand. Pecans or cashews would also be very tasty and crunchy! Hi Carrie- This stuffing recipe looks so delicious. I will definitely have to try this out over the holiday season! Hi! This looks good and my local Harris Teeter carries the FFL Brown Rice Bread (except it's nearly $7/loaf). I usually eat it for breakfast w/peanut butter toasted. Stuffing was the one thing I was going to miss on my first GF T-giving. Thanks for the recipe! The stuffing is my fav too - this looks delish. If we don't talk before have a great Thanksgiving! I've never met a stuffing I didn't like. Love the addition of the seeds! Walnuts and sunflower seeds? Sounds like the perfect addition to me =D. Love the sound of this stuffing! You and me girl! Thanksgiving is all about the stuffing! I have never used nuts in stuffing since I use my mom and grandmother's recipe, but have always thought it sounds so good with nuts! Sounds great and super easy! I have actually never made a gluten-free stuffing before using bread, I usually do stuffing with wild rice, mushrooms, and pecans...but this sounds really nice, especially with the poultry seasoning! My mother love nuts, any kind of muts! She will surely love this recipe because of the walnuts! I can't wait to try this! Thanks! Awesome! Thanks. I am going to attempt to make a cornbread stuffing this week and I will be consulting this page! Happy Thanksgiving! I love the idea of stuffing with walnuts, Carrie. I've never been a stuffing fanatic, but I made stuffing this year from tortilla chips and it was amazingly good. Everyone enjoyed it. It's nice to have gf stuffing no matter how you make it! Hello, my name is Megan Colyer and I am the Shiloh Farms Marketing Coordinator. Shiloh Farms is searching for Gluten Free recipes to feature on our new gluten free product packages. 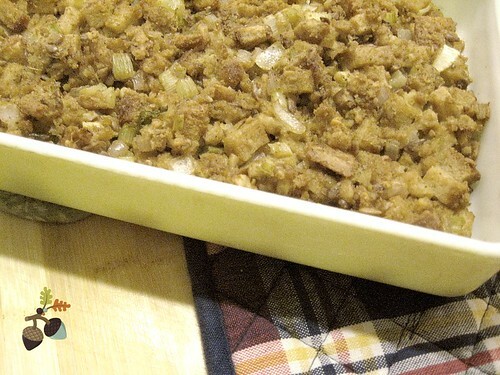 Would you be willing to share this recipe for Gluten Free Walnut Stuffing/Dressing. We carry gluten free sunflower seeds and walnuts. Please contact me at m.colyer@shilohfarms.com. I look forward to hearing from you.